‘Informative, entertaining and filled with enthusiasm’ described our first Skills and Ideas Day at St George’s Church, Bloomsbury. Josie Brown, Susie Leiper FSSI and Celia Kilner shared both their knowledge and enthusiasm for their individual subjects and gave the 36 participants an opportunity to experience the techniques shown for themselves in the practical afternoon session. Josie started with an illustrated talk on the skills involved in the ancient art of metal point, including some interesting historical background, and in the afternoon demonstrated some of the metal point techniques. Everyone had a chance to try it using various metals and tools on a range of grounds. 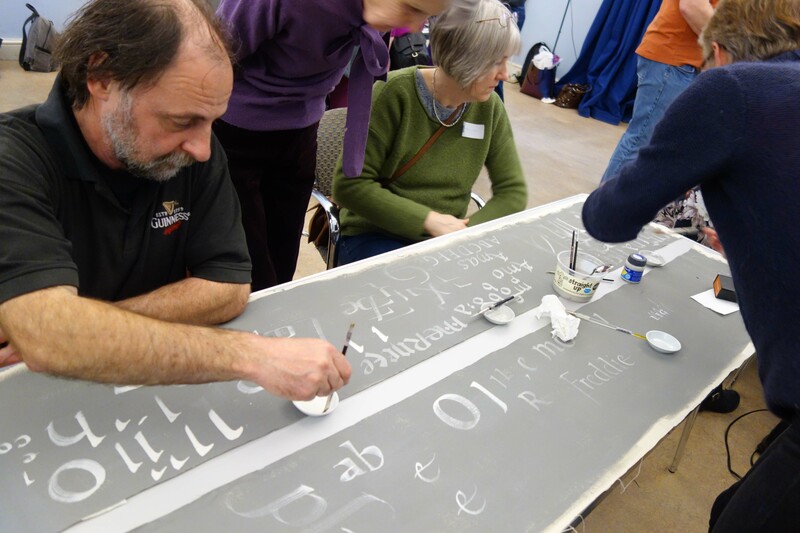 Susie Leiper followed with her talk, accompanied by lovely images about lettering on both canvas and wood. 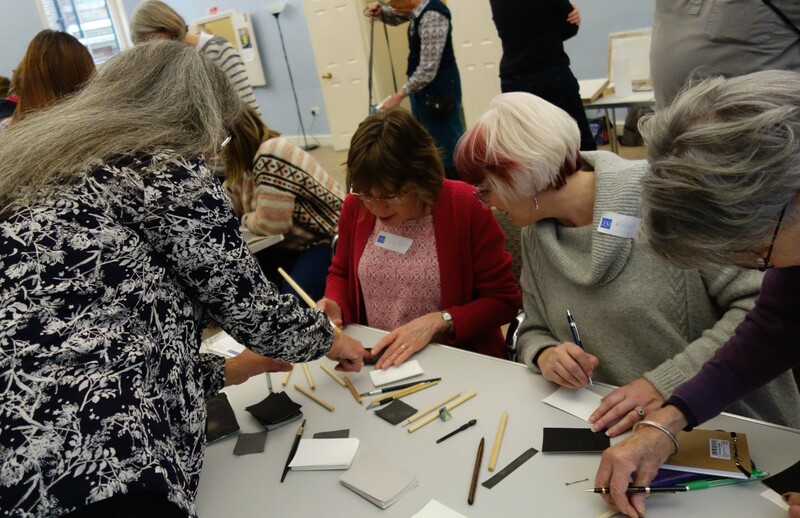 In the second part of the day she demonstrated brush lettering on canvas and laid out canvas, brushes and paints for participants to try. Celia Kilner’s fascinating talk covered lettering using a wide variety of materials and techniques, including stone, glass and rubber as the base for phrases and quotations. After lunch she demonstrated some of her methods and participants explored the use of these materials. An added bonus was a display of work by students on the 2018 Study Days (led by Ann Hechle FSSI). A big thank you to all our speakers as the day could not have happened without their willingness to participate. We feel very fortunate to have had such first-class practitioners sharing their skills so generously.